World comes together when people travel and meet. From halal spas to prayer rooms at airport terminals, the global tourism industry is gearing up for a projected boom in Muslim travel over the next decade. From halal spas to prayer rooms at airport terminals, the global tourism industry is gearing up for a projected boom in Muslim travel over the next decade, experts say. Their growing number and affluence means Muslims — especially from the oil-rich Middle East — are travelling like never before, and it is a trend that looks set to gather pace. Spending by Muslim tourists is growing faster than the global rate and is forecast to reach $US192 billion ($A182 billion) a year by 2020, up from $US126 billion in 2011, according to a study by two companies specialising in the market. 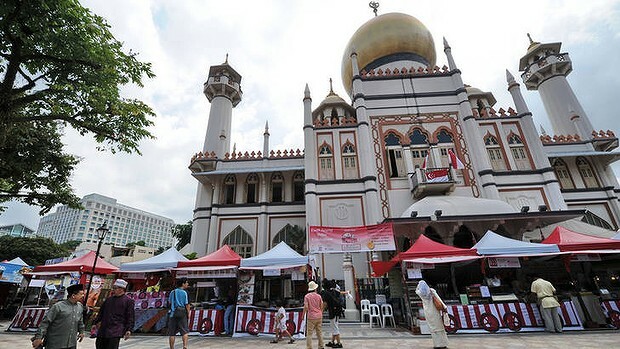 The study, made available to AFP, was conducted in 47 countries by Singapore-based halal travel specialist Crescentrating, along with DinarStandard, a US-based firm that tracks the Muslim lifestyle market. Crescentrating chief executive Fazal Bahardeen said Muslim-majority states such as Egypt, Malaysia and Indonesia were already favourite destinations, but non-Islamic countries are now “taking a serious look” at Muslim holidaymakers. Malaysia, the number-one destination according to the findings, attracts Muslim visitors even during the ongoing fasting month of Ramadan. Mohammed Ali Alali, 23, a petroleum engineering student from Dammam, Saudi Arabia, went there on honeymoon with his bride, a 20-year-old medicine student. “It’s not that far from Saudi Arabia and it’s less expensive to travel here rather than Europe. It’s also an Islamic country so that helps in many ways, like to find a mosque and Arabic food,” he said after breaking fast at an Arabic restaurant in the capital Kuala Lumpur. The availability of halal food tops the list of Muslim travellers’ requirements, according to the survey. Destinations such as Thailand and Australia, especially the Gold Coast, are already taking into account these travellers’ needs in their services and facilities, Fazal said. That includes prayer rooms at airports and hotels, halal restaurants and even spas adapted to religious requirements. “Why not try Gold Coast for a cooler Ramadan this year?” says the tourism website of Australia’s Queensland state. The Economist Intelligence Unit said in a March report that meeting the needs of the world’s 1.8 billion Muslims is fuelling business opportunities in numerous sectors. “From food and Islamic finance, the industry is spreading its wings into pharmaceuticals, fashion and tourism, among many other areas,” it said, noting more than half of the world’s Muslim population is aged 24 or younger, many of them well-educated. Thailand is hungrily eyeing the Muslim travel boom. Its tourism authority — which has an office in Dubai — is promoting halal spas for Muslim tourists, who require strict privacy for male and female clients. It also organised a month-long festival of Thai cuisine in the United Arab Emirates from June 8 to July 7. Crescentrating’s study ranked Bangkok’s Suvarnabhumi Airport the most Islam-friendly airport in a non-Muslim country. And it found that tourists from the Gulf — Bahrain, Kuwait, Oman, Qatar, Saudi Arabia and the UAE — are the sector’s biggest spenders. Gulf countries accounted for 37 per cent of Muslim tourist spending in 2011 even though they represent a mere three percent of the global Muslim population. Whispering Hill, a part of Lal Sohanra Park near Bahawalpur, one of Pakistan’s largest reserved forests is spread over 88,400 hectares. It is the country’s largest reserve of wild deer and bird species. Photographs of Whispering Hill are some of the 140 photographs displayed at the exhibition Forest of Life at the Alhamra Art Gallery on The Mall. It opened on July 10 and shall continue till July 18. The photographs have been taken by Yasir Nisar, a landscape photographer, sopported by funds from Engro Polymer and Chemicals (EPCL). Nisar says he took over 40,000 photographs of 10 types of forest cover in the country for the project. EPCL began its Go Green drive in 2009, declared International Year of Forests by the United Nations, and has planted 635 acres of forest in the galliyat and mangroves in Sindh. Spread across three halls in the gallery, the photographs include the conifer forests of the Ayubia National Park, the chilghoza pines of the Chitral Gol Park, Fairy Meadows, autumn in Hunza, summer in Skardu and Shandur, the Khal Maghsi desert in Balochistan, apricot gardens in Swat and Margalla Hills,. Sara Aziz, an EPCL communications officer, had accompanied Nisar in the photography expeditions from May 2011 till June 2012. Aziz said the display is a platform to show the variety of forest cover in Pakistan. “Forest cover is now less than four per cent of country’s total area,” she said. Aziz has been researching forest zones in collaboration with the IUCN, Pakistan and WWF, Pakistan. “No group had documented all the forest zones in Pakistan. This is the first project to do so,” she said. Nisar said 80 per cent of the photographs used in the display were taken after May 2011. “We also used some old pictures since it is impossible to capture various seasons in each forest over a single year,” he said. “We visited Shandur in early summer last year. It was very difficult to photograph since there were barely any people there. He said that he saw no wild bears in Deosai despite staying there for a week. “I had spotted them within two days when I visited in 2006 and 2009,” he said. The exhibition will be taken to Karachi and then Peshawar after Ramazan. The landscape of Khyber Pakhtunkhwa is rich in forest varieties. Displaying the photographs in Peshawar is perhaps more important than exhibiting them in Islamabad, Aziz said. Aziz said that some visitors had encouraged them to conserve forests. The Fisheries DG and Wildlife DG had visited the exhibition on July 10 and shown interest in the project, she said. LAHORE: An exhibition of photographs titled ‘FoRest of Life’ was opened at Alhamra Art Gallery on Tuesday, showcasing the rich flora of Pakistan. The pictures on display have been captured by Yasir Nisar, and represent various forests of the country, including sub-alpine coniferous forests, dry temperate coniferous forests, moist temperate coniferous forests, sub-tropical pines, dry tropical broad leaved forests, dry tropical thorn forests, riverain forests, mangroves, irrigated plantations and liner plantations. Addressing the inauguration, Engro Polymer and Chemicals Limited CEO Khalid Siraj Subhani said, “Forests represent the sheer strength of nature, and consequently, a nation, and as responsible corporate entities, we believe it is our duty to protect this natural endowment. ” The exhibition has been launched with a collective aim of reaching out to the community and creating an acute awareness of the importance of preserving this important resource. Bollywood stars and cricketers are part of Australia’s push to attract visitors from the subcontinent, writes Robert Upe. Australian tourism officials are targeting Delhi and Mumbai to lure more Indian travellers here. Along with China, India has one of the world’s fastest-growing outbound travel markets, and more than 50 million Indians are expected to take overseas trips by 2020. A scene from Indian movie Salaam Namaste, filmed in Melbourne. 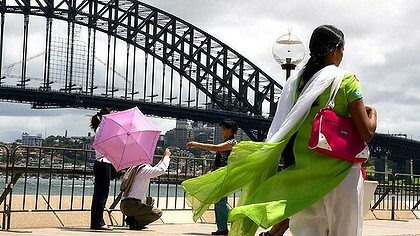 Tourism Australia says Bollywood stars will be used to spruik holidays in Australia. India is Australia’s 11th-biggest inbound tourism market, bringing in 148,200 visitors who spent $867 million last year, but by 2020 officials say that could reach 300,000 visitors spending $2.3 billion. Delhi and Mumbai have been targeted by Australia because they have an emerging middle class and India’s highest concentration of affluent households. The Minister for Tourism, Martin Ferguson, unveiled an India 2020 strategic plan last month at the annual Australian Tourism Exchange in Perth, the largest travel trade show in the southern hemisphere. “We have put a huge effort into attracting tourists from China recently and the next cab off the rank is India,” he said. The plan means that Tourism Australia’s “There’s Nothing Like Australia” campaign will be rolled out in Delhi and Mumbai and there will be extensive advertising on TV and digital channels as well as print. Tourism Australia will spend $5 million on the India campaign in the next year and will also use cricketers and Bollywood stars to spruik the virtues of holidaying here. Cricketers Steve Waugh and Brett Lee have acted as advocates in the past, and more Australian Indian Premier League (IPL) players may be recruited. Another focus of the strategy is to establish direct air links between Australia and India. There are no direct non-stop flights between the countries but talks are taking place with several airlines believed to include Qantas, Virgin and Air India. Ferguson says there are 70 national tourism organisations from around the world active in India, and competition to win Indian travellers is fierce. The India 2020 strategic plan follows the China 2020 strategic plan that was announced by Tourism Australia in June last year, which aims to lure a share of the 100 million Chinese who will be travelling by 2020. The managing director of Tourism Australia, Andrew McEvoy, has denied suggestions tourism officials are concentrating marketing efforts on China and India at the expense of other more established visitor countries. McEvoy says Tourism Australia will also target Japanese travellers later this year. “We will do something big and significant to reignite our relationship with the Japanese traveller,” he says in reference to the drop in visitors since last year’s earthquake and tsunami. Robert Upe travelled to Perth courtesy of Tourism Australia. Ecodivers conducts a range of projects, self initiated or in support of specific research or data collection. Some ongoing projects include monitoring seagrass in several key areas, removal of fishing debris and man-made objects from Cabbage Tree Bay Acquatic Reserve (CTBAR), inspection of beach and swimming enclosure nets to record bi-catch and release live animals. Providing a response, photographic and video evidence of illegal fishing activity for forwarding to relevant authorities. Removal of invasive species (Caulerpa Taxifolia) and recording of specific items of marine debris (Bait Bags / Soy Fish / Balloons / Cigarette Butts).